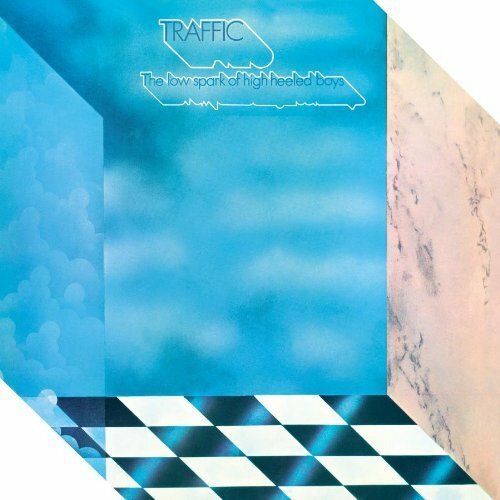 Traffic was one of the premier architects of the acid rock movement in the sixties and blossomed further into one of the most important super groups of the seventies. Their recordings are the soundtrack to a generation of music enthusiasts that continues to this day and will forever stand the test of time. In 1972, the legendary founding members Stevie Winwood, Jim Capaldi and Chris Wood sojourned on after a smash outing with John Barleycorn Must Die and continued the winning streak with the groundbreaking classic The Low Spark Of High Heeled Boys. Along with new members Jim Gordon (Derek & The Dominoes), Rick Gretch (Blind Faith) and Rebop Kwaku Baah, Traffic was back and on a roll artistically unlike many other important acts of the classic rock era. Known for more than its amazingly cube shaped album cover, the multi-faceted music inside was a non-stop enjoyment of sounds never heard or recorded since. Whether standout tracks from the pens of Jim Capaldi like the hard rocking Light Up Or Leave Me Alone or the powerful balladry of ancient sounds with the Winwood/Capaldi classic Rainmaker, this brilliant album will most certainly be known forever for its classic title track, the massive twelve minute plus epic, The Low Spark Of High Heeled Boys. Filled with explosive sax breaks by the late Chris Wood, the piano driven and vocal delivery of master musician legend Stevie Winwood and the percussive vibrations of the late great Jim Capaldi, Jim Gordon and the late Rebop Kwaku Baah, the song was destined to become a huge success. Even further classics ensued with each of the lengthy six tracks that make up this arresting masterwork... how about Rick Gretch and Jim Gordon's blazing smash Rock 'n' Roll Stew or the Winwood/Capaldi classic Many A Mile To Freedom. No matter where you go with this album, it's all about Traffic, classic Traffic, and it just doesn't get much better than this. It is now with much anticipation and honor to announce the Traffic/Friday Music 180 Gram Audiophile Vinyl Series as we begin with our first installment with their monumental classic of the ages The Low Spark Of High Heeled Boys. Mastered impeccably by Joe Reagoso from the original Island Records tapes at Friday Music Studios, The Low Spark Of High Heeled Boys is a truly one of the most important audiophile vinyl releases of this year. To make this an even more enjoyable limited edition happening, for a very short time, we are also going back to the original Tony Wright designed cube shaped die-cut album cover, for the first time in North America since its 1972 release! Look to the Friday Music label for more Traffic masterpieces on 180 Gram Audiophile Vinyl in the very near future. Welcome back Traffic... The Low Spark Of High Heeled Boys... On pristine 180 Gram Audiophile Vinyl... a true rock classic... only from your friends at Friday Music.